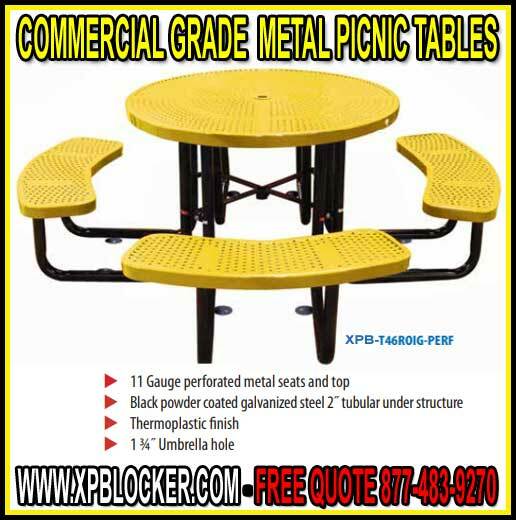 XPB Locker carries a comprehensive selection of metal picnic tables. Facilities with deteriorating wooden picnic tables can buy metal replacements that retain their structural integrity and coloration for well over a decade. These tables, available in a variety of shapes and sizes, include in-ground, concrete mounted, and portable mounted options. Tables are made in the United States and covered by comprehensive warranties. Perforation does three things. First, it creates just enough flexibility so that when a person sits down, the seat gives way ever so slightly. Many people consider this more comfortable than a seat made from a contiguous piece of metal. Second, perforation allows the bulk rainwater and spilled drinks to pass quickly through the tabletop or seats. It is much easier to wipe down a table made from perforated metal than it is a solid surface. Perforated metal also dries more quickly, so people can use these tables right after a rain shower without getting their clothes wet. Commercial grade metal picnic table frames are made from black powder coated galvanized steel 2”. Galvanized steel in and of itself is corrosion resistant. We add a black powder coating to further protect the frame. In addition to resisting rust, the black powder coating also protects against airborne chemical agents. There is also a certain aesthetic appeal that goes along with black powder coating. The darker color makes it a better compliment to surrounding vegetation and structures. Commercial Grade metal picnic tables are protected by a thermoplastic finish. Thermoplastic is an amazing substance. It protects tabletops and bench seats from moisture. Thermoplastic is a coating that is applied at the factory to the perforated metal. It features a contiguous color throughout, making it unnecessary for the table to ever require painting. Thermoplastic is available in both standard and non-standard colors. Many commercial grade metal picnic tables can be modified for ADA compliance. If you need tables that are wheelchair accessible, be sure to mention this to us. Most of our lines can be modified to accommodate disabled persons. Call today.